Hello, Wolf! Good Maen, good people. Didn't find a direct solve today but started with 7, 6 and 2 then finished obvious almost-complete columns and rows and cells and all of a sudden it was solved. 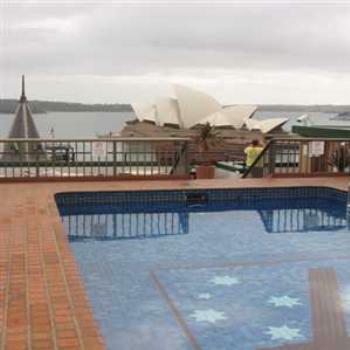 What a picture perfect location in today's photo of a rooftop pool overlooking Sydney Harbor. Good Maen everybody from Texas! I wanted to pop in before I get back to grading papers. Ugh. Have a GREAT day. Wow - nice pool and spectacular view too! Morning. Lanky Yank strikes again. Sunny after a cloudy start. Supposed to cool down this afternoon. My kind of day! I suggest we all meet at the pool! That's the kind of pool that I like! Shiela - I second that motion! Morning all,today wouldn't be a good day at that pool, it's raining. Sydney Olympic Park received 70 ml of rain in 24 hours. I hope the country farmers got a little of that rain. They certainly need it. I don't think Brissy is going to get much rain, today! (Though I have just washed all our bedding so I have probably guaranteed some! )I am doing a happy dance for the Farmers who got some. They really needed it! I have been suffering from man flu for the past few days. I have tried to tell she who must be obeyed how seriously ill I am and that I should be tended 24/7 by trained medical staff; but she is showing very little sympathy. She is sounding like my rugby coach mentioned a couple of days ago. I'm sorry you're not feeling well Arachnid, get well soon. I'll have a green can, thanks. That's Darwin speak for VB. Most pubs in the Northern Territory don't sell beer in glasses or bottles so they can't be used as weapons or left as a treacherous mess for the staff to clean up. What does 70 ml mean in rain quantity. That's not much liquid in a measuring cup. 70 ml per .. what? Or was it 70 millimeters? 70 mm? That is how we measure rainfall in our non-decimal system....and 70 mm would be 2.75 inches, which is indeed a LOT of rain! A cold good morning to all ~ no frost on the pumpkins yet, but very soon!